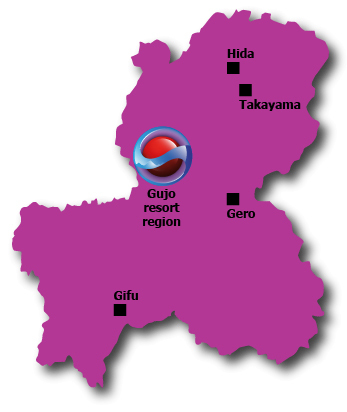 Gifu Prefecture is located centrally in the Chubu region of Japan and is surrounded by other prefectures with no coastline. In fact Gifu shares borders with seven other prefectures - Aichi Prefecture, Fukui Prefecture, Ishikawa Prefecture, Mie Prefecture, Nagano Prefecture, Shiga Prefecture and Toyama Prefecture. Over 20 ski and snowboard resorts are spread across the northern part of Gifu Prefecture, with a number concentrated in a region of Gujo City. Other popular tourist attractions are the UNESCO World Heritage site at Shirakawa-go and the historic district of Takayama. Numerous famous hot spring resorts make it a popular destination with many Japanese and overseas visitors.